An RCE is a network of existing formal, non-formal and informal organisations that facilitate learning towards sustainable development in local and regional communities. A network of RCEs worldwide will constitute the Global Learning Space for Sustainable Development. Research and development - addressing the role of research and its inclusion in RCE activities, as well as contributing to the design of strategies for collaborative activities, including those with other RCEs. RCE stakeholders - An RCE involves school teachers, professors at higher education institutions, environmental NGOs, scientists, researchers, museums, zoos, botanical gardens, local government officials, representatives of local enterprises, volunteers, media, civic associations or individuals who work in the spheres of sustainable development such as economic growth, social development, and environmental protection, students and learners at all levels. The RCE network also works closely with the Ubuntu Alliance, an association of 14 of the world’s foremost educational and scientific institutions that together signed the Ubuntu Declaration at the Johannesburg Summit in 2002. Some Alliance members make up the Ubuntu Committee of Peers for the RCEs, reviewing RCE Candidates and giving strategic advice on the development of the RCE network. 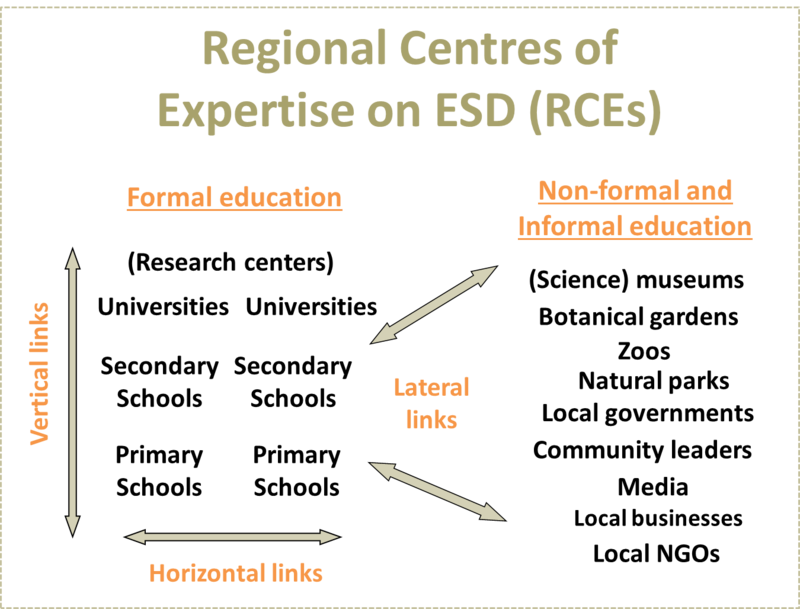 RCEs bring together institutions at the regional/local level to jointly promote ESD. They build innovative platforms to share information and experiences and to promote dialogue among regional/local stakeholders through partnerships for sustainable development. They create a local/regional knowledge base to support ESD actors, and promote four major goals of ESD in a resource-effective manner. Re-orient education towards SD, covering existing programmes/subjects from the point of ESD and designing and integrate SD in curricula. ESD programmes are tailored to address issues and local context of the community in which they operate. Lead advocacy and awareness-raising efforts in the public about the importance of educators and the essential role of ESD in achieving a sustainable future. RCEs promote the long-term goals of ESD, such as environmental stewardship, social justice, and improvement of the quality of life. For more information about RCEs or how to become a member, please contact the Global RCE Service Centre, Education for Sustainable Development Programme, UNU-IAS, rceservicecentre@unu.edu.